On Sunday, August 7, the Old Cathedral of the Holy Virgin in San Francisco celebrated its annual Patronal Feast Day in honor of the Icon of the Mother of God “Joy of All Who Sorrow” (with coins). His Eminence, Archbishop Kyrill of San Francisco and Western America celebrated the Hierarchical Divine Liturgy with the Deputy Rector of the Old Cathedral, Abbot James (Corazza), and visiting priests Rev. 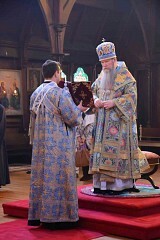 Ioann Comanescu of the Holy Protection Russian Orthodox Church in Palo Alto and Rev. Florin Lapustea of the Holy Cross Romanian Orthodox Church in San Jose, along with Rev. Deacon Nikolae Lapustea and Rev. Hierodeacon Peter (Karakozoff). Special guests came to participate in the Feast Day: the Metropolitan Choir of the Holy Archangels from the Romanian Orthodox Cathedral in Paris, France. 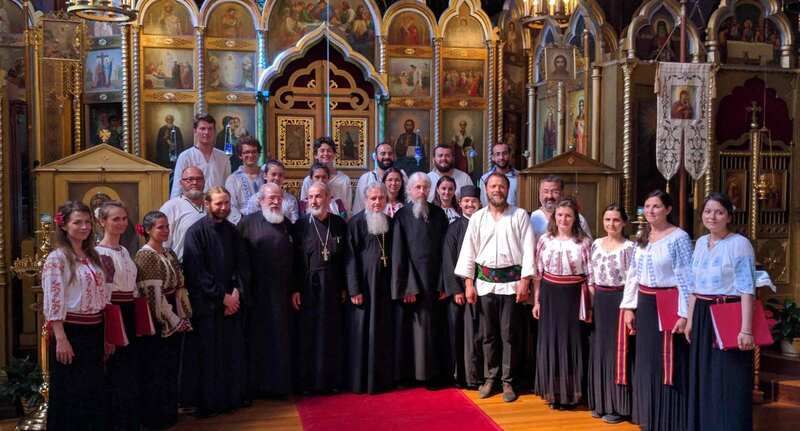 The choir came to sing the Hierarchical Divine Liturgy, and, after the festal meal that followed, to perform a concert of Romanian liturgical and folk music. This choir members came to the United States for two reasons. Firstly, to make a pilgrimage to holy places and to venerate the relics of St. John of Shanghai & San Francisco; and secondly, to perform choral concerts and donate the proceeds to the St. Paraskeva Foundation, which supports orphanages in Romania. They feel a special connection with St. John, who, while he was the Archbishop of Western Europe in the 1950’s, occasionally served at the Romanian Cathedral in Paris. St. John’s influence and guidance in the coming of this choir to our country and city is strongly evident. As is well known, St. John dedicated much of his archpastoral labors to the care of orphans. 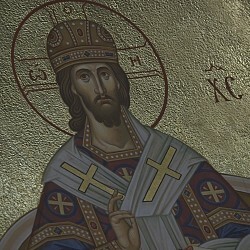 The generosity of the choir in donating the concert proceeds to orphanages in Romania follows in the spirit of St. John. Further, St. John is a Saint of universal significance, having served in numerous countries and ministered to diverse flocks throughout the world during his truly apostolic service. The choir sang prayerful and majestic music for the Hierarchical Liturgy in several languages—English, Romanian and Slavonic—thereby attesting to the universality of the Orthodox Faith and the oneness of mind and heart which its members share across cultural and geographical boundaries. Before coming to San Francisco, the choir expressed its wish to sing in a church in which St. John served, and it was at the Old Cathedral that St. John began his Archpastoral service in San Francisco in November of 1962. The choir’s participation in this feast day constituted an “unexpected joy” for everyone present. We are deeply grateful to the members of the Holy Archangels’ Metropolitan Choir for making this day such a special one and pray that they may once again make a pilgrimage to San Francisco.